The KEYSET Cursor in SQL Server can only move from the first row to last, and last to first. When the cursor is open, the order of the rows and the membership is fixed. 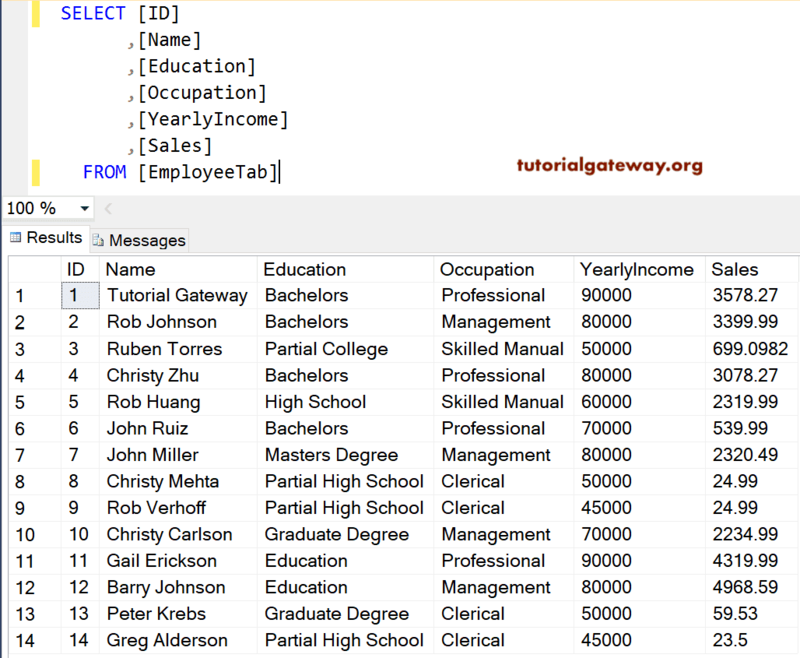 And the set of a key that identifies the rows uniquely will be stored in a table under tempdb database. 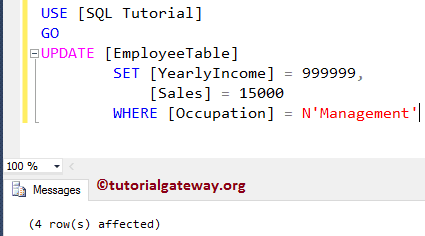 Remember, to use the SQL Keyset cursor on a table with a unique key, otherwise, this cursor will act like any other static cursor. 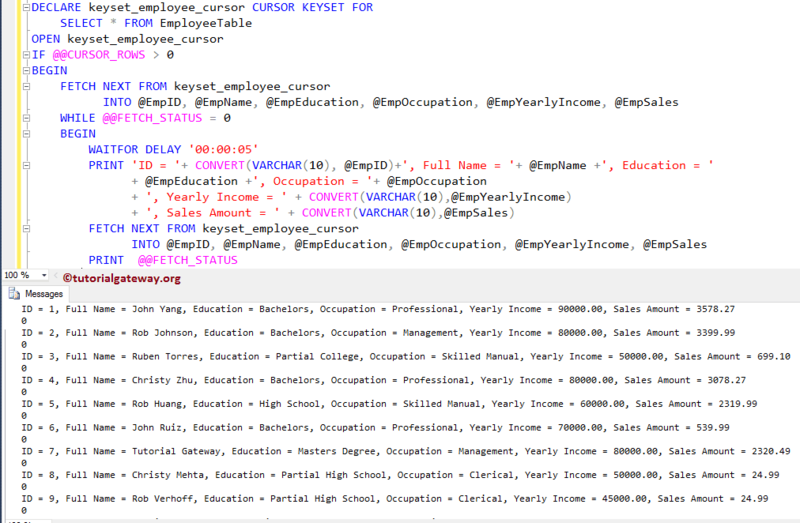 Once you Open the SQL KEYSET Cursor on Employee, any INSERT operations on that table will not be reflected in the Cursor but both DELETE and UPDATE operations will be reflected. 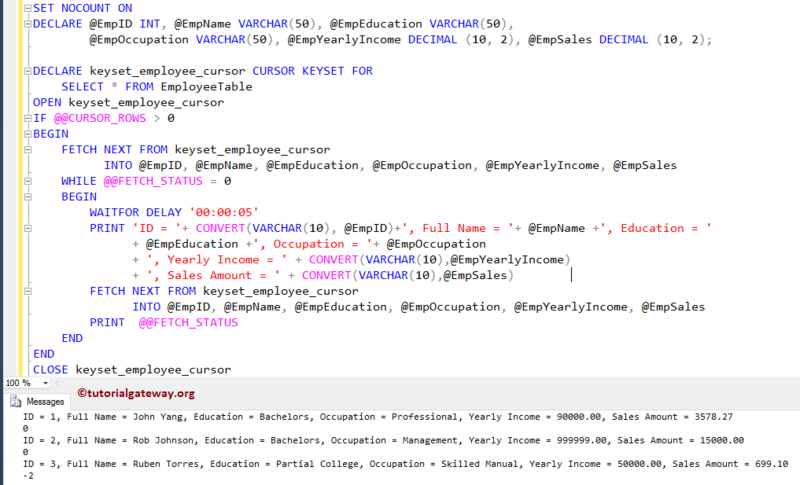 In this article we will show you, How to Create a keyset Cursor in SQL Server with example. 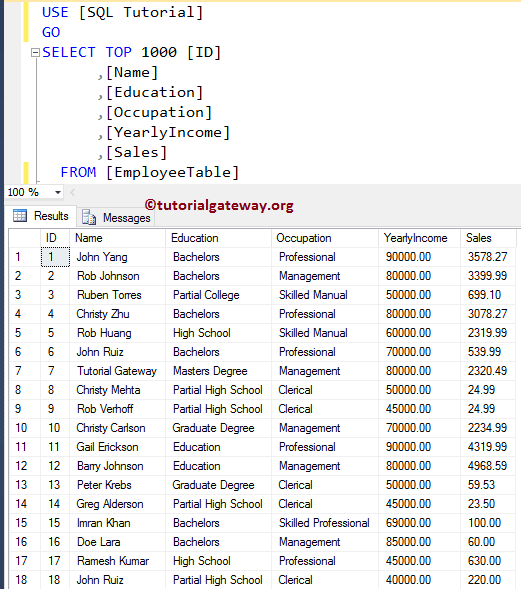 In this example, we will show you, How to declare and open a keyset cursor in SQL Server, and how to fetch rows from the cursor. In this example, we will use the WHILE LOOP to loop over the cursor elements and print them as output. 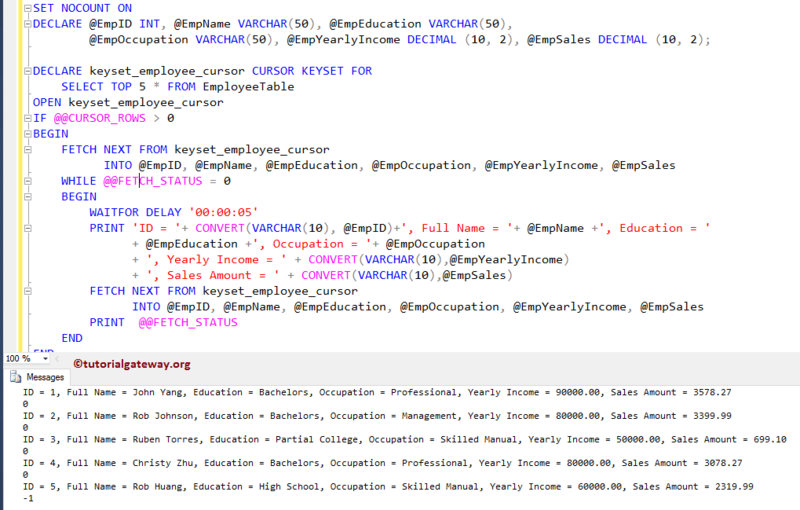 If you observe the cursor declaration carefully, we are using KEYSET cursor, while declaring the cursor. 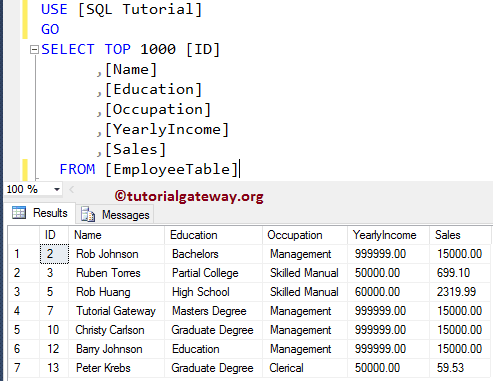 We already explained the remaining steps in our previous article, I suggest you refer Static Cursor in SQL Server example. In this example, we will show you, what will happen when you perform INSERT operation while the Cursor is Open. If you observe the below screenshot, though we have inserted four new records into our Employee table, the keyset cursor is returning the top 5 records. This is because, once the cursor is open, it will fix the key value, and an insert operation by another user will not be reflected inside the cursor. 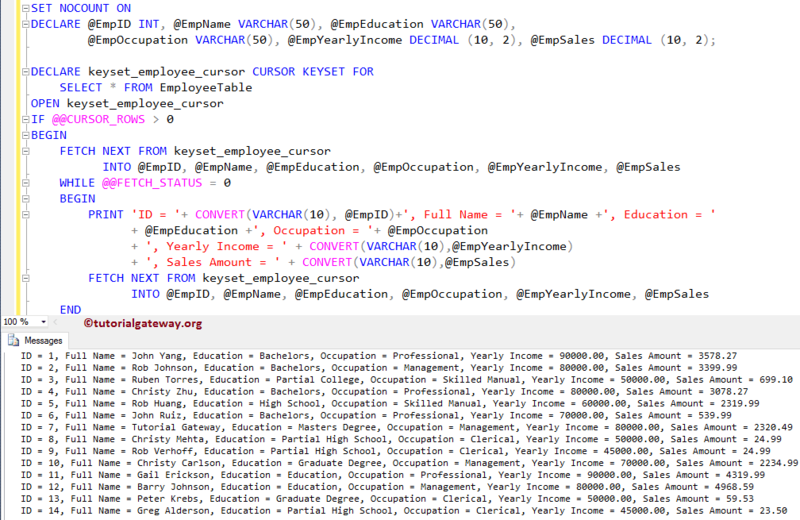 Please use the following SQL Query to check whether the new records that are inserted into the Employee table or not. In this example, we will show you, what will happen when you perform UPDATE operation while the Cursor is Open. 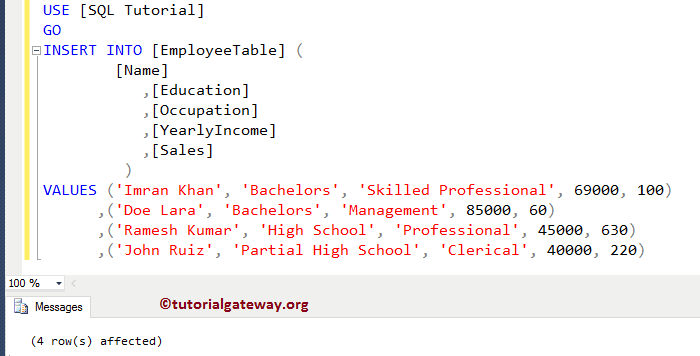 For this, we are using the cursors definition that we used in our previous example, and here we are selecting all the columns instead of Top 5. If you observe the below screenshot, though the keyset cursor is open, it is showing the Updated values from our Employee table. This is because, even though the cursor is open, it can read the updated values (values updated by another user). Let me check the Employee table, whether the Update has happened at the server level or not. 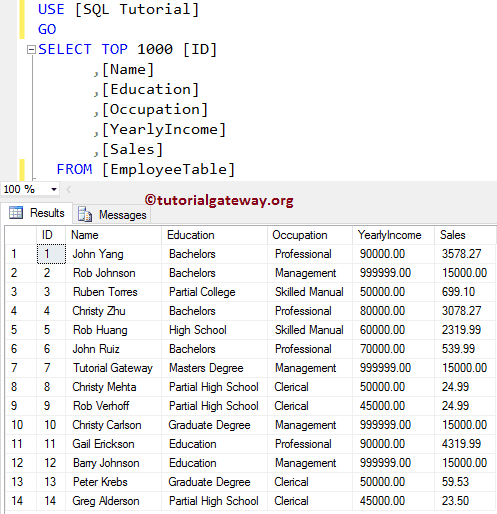 In this example, we will show you, what will happen when you perform DELETE operation while the Cursor is Open. 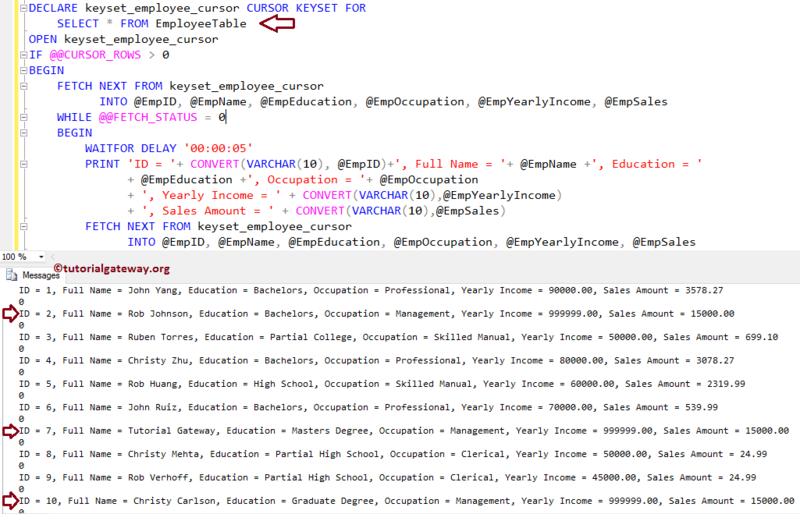 For this, we are using the cursors definition that we used in our previous example. If you observe the below screenshot, though the keyset cursor is open, it is terminated after it reaches 3rd record because the 4th record has the Occupation = Professional so the fetch status is returning -2. Try to increase the Time delay to get the correct result. Let me check the Employee table, whether the delete has happened on the original table or not.